The sixth annual Monster Energy Aftershock brought 50,000 rock and metal fans to a sold out Discovery Park in Sacramento, CAon Saturday, October 21 & Sunday, October 22 for a massive weekend of music that included performances from legends Nine Inch Nails and Ozzy Osbourne (recently reunited with guitarist Zakk Wylde for the first time in over a decade), plus A Perfect Circle (who premiered their new song “The Doomed,” the first new track in four years), Five Finger Death Punch, Run The Jewels, Stone Sour, Mastodon, and more than two dozen others. In addition to music, California’s biggest rock festival featured artist signings and meet & greets at the Monster Energy Experience and The Music Experience, charities Take Me Home animal rescue (which featured a special appearance by guitarist Gary Holt of thrash legends Slayer and Exodus) and Dyin 2 Live / Fxck Cancer, plus the Caduceus Wine Garden, nearly two dozen food vendors from the capital region and beyond, the interactive Juxtapoz Make Your Mark Art Zone, activations from Coors Light and Heavy Grass, and more. Monster Energy Aftershock concluded the Fall For All festival series, which kicked off with Louder Than Life (Sept. 30 & Oct. 1 in Louisville, KY) and also included Monster Energy Rock Allegiance (Oct. 7 in Camden, NJ). For more on Fall For All, visit: www.TheFallForAll.com. Be sure to catch Power Trip on their upcoming tour with Cannibal Corpse, dates below. 05/27/2018 Modified Ghost Festival – Vancouver, B.C. With the addition of Czech experimental black metal legends MASTER’S HAMMER, the line-up for Eindhoven Metal Meeting 2017 is now complete! 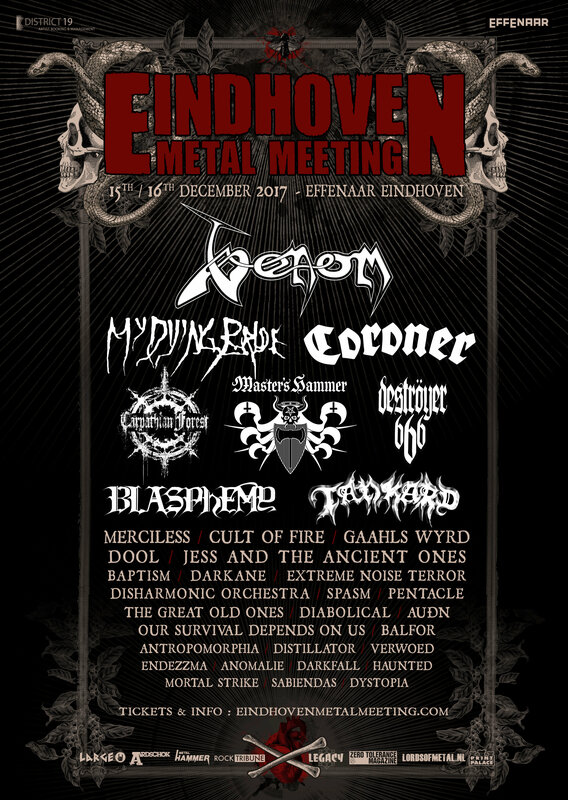 The ninth edition of Netherlands’ longest-running indoor extreme metal festival will take place on Friday 15 & Saturday 16th of December 2017 at the renowned Effenaar venue in Eindhoven. A total of 34 bands will make their appearance at the festival. Tickets are available on the official festival website. The highly anticipated lineup for the New Orleans based Voodoo Music & Arts Experience has been released, and it will be held on Halloween weekend of 2017, October 27th to 29th. The festival will be headlined by none other than Kendrick Lamar, Foo Fighters, The Killers, LCD Soundsystem, and DJ Snake. Single day lineups will be announced later down the road. Tickets are on sale now, starting at $140 (plus fees) for three-day general admission. You can learn more about ticketing options by clicking here. You can view the full lineup below, and click here to learn more about each artist performing at Voodoo this year. with the genre’s hottest developing artists. activities, Rock On The Range sets the standard for American rock festivals. Throne, Cane Hill, and Citizen Zero, with more to be announced. making it the largest of its kind in North America. fees) are also available for purchase at Rock On The Range. On The Range partner GovX. the Monster Energy Main Stage area from the VIP Tent. Download the Rock On The Range mobile app (available for FREE via iTunes and Google Play) for festival information and band performance times. Rock On The Range is produced by Danny Wimmer Presents, AEG Live, and MAPFRE Stadium. Rock On The Range is supported by great sponsors including: Monster Energy, Jack Daniel’s, Zippo, The Music Experience (formerly known as Crazy Dave’s) and Bud Light.